Folks, have you been to visit The Left Bank Shop & Gallery in McGregor, Iowa, yet? If not, you are missing out on some amazing artwork! The best local artists (within a 100-mile radius) have work for sale at The Left Bank. You can find anything from jewelry, baskets, ceramics, paintings, photography, sculpture, and more! 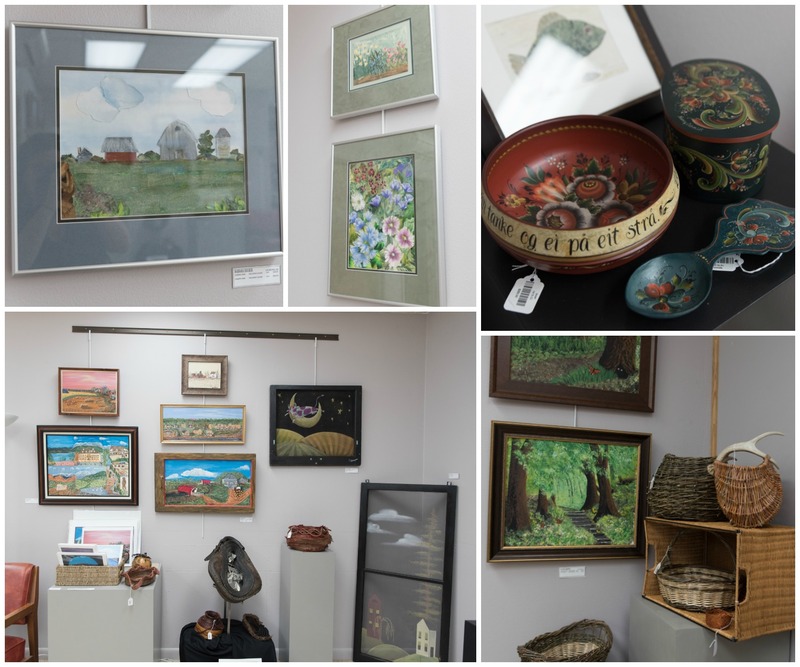 Not only is this a great space to come for awesome Iowa-made gifts, but there is always an excellent show in the special exhibits gallery. For a couple of more days (2 days...until June 27th! ), you can see a really cool exhibit from local and regional folk artists. If you aren't sure what "folk art" is, this is your chance to see a great selection that can open your eyes to an eclectic genre of art. For example, at first glance you may think you're looking at a whimsical painting, but at closer consideration, you'll be amazed at the detail in Barbara Decker's wallpaper collages! You'll enjoy the melodic landscapes painted in oil by self-taught artist Carol Hartmann. Nancy Schmidt's rosemaling, a decorative Norwegian folk painting, is expertly detailed. You'll be captivated by the paintings of Suzanne Aunan, the primitive work of Teresa Champion, and the exquisite pine basket weaving by Roberta Condon. So don't miss out on this enchanting exhibit! Here are a few images in case you can't get there before the 27th. 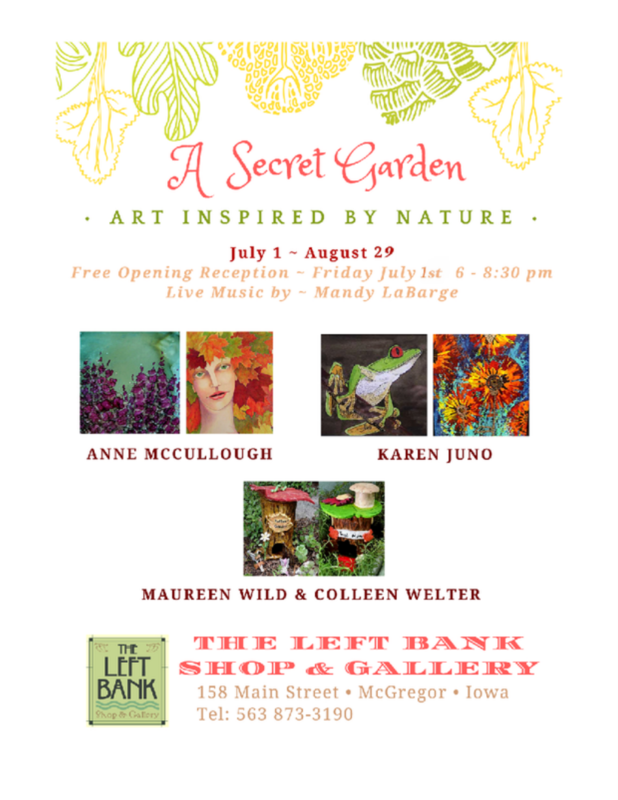 And... if you missed this first exhibit of the season, you can always checkout the next exhibit, "A Secret Garden: Art Inspired by Nature," which opens on Friday night, July 1st! Stop in Friday, July 1st between 6pm and 8pm to enjoy free beverages, snacks, and LIVE music by Mandy LaBarge! 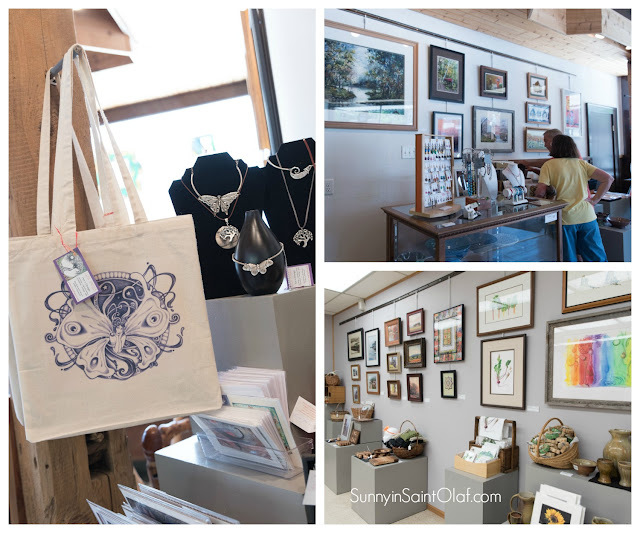 You're in for a treat because the artwork of Ann McCullough, Karen Juno, Maureen Wilde and Coleen Welter is magical! Also, this is a great chance to see a preview of one of our Art in the Park 2016 artists, Ann McCullough. I can't wait to take my baby girl to her first art exhibit at the Left Bank! Hope to see you all Friday!